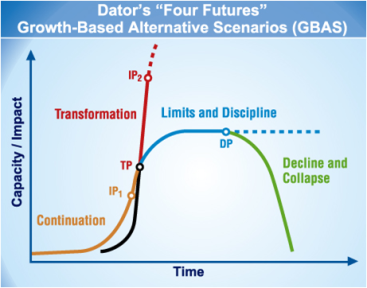 The graphic at right displays these four growth-based alternative scenarios in terms of these classic growth curves. In the curves above, IP stands for inflection point, DP for decline point, and TP for transformation point, points after which careful observers can notice and forecast changes in future growth. One major insight for leaders is to recognize that all four change stories are often being told by different parties at the same time. Each can be a valid perspective for the interest groups telling each change story. Another insight is to realize that each of us, and our clients, tell all four of these stories at different times..
For foresight professionals, discovering which stakeholders represent each point of view, and describing any other hybrid views that may exist, is thus a great first learning goal (Skill 1 of the Eight Skills) in foresight research. Let’s look with a bit more depth at each of these curves now, along with a few lesser-known curves, to get a deeper understanding of probable, possible, and preferable change.